Great news! On November 16, 2015, Make the Road New York (MRNY) celebrated the creation of the Flushing Meadows Corona Park Alliance. The Alliance will ensure the community’s voice in future decisions about the park, allocate more financial resources and oversee general improvements. Flushing Meadows Corona Park (FMCP) is the biggest park in Queens — nicknamed the ‘lungs of Queens’ by our members. It’s valuable green space for many thousands of working families. Yet it doesn’t have the resources it needs. Currently, the park only has 18 full-time employees who care for 897 acres, while Central Park employs 291 workers to maintain a smaller area. Since 2012, members of Make the Road New York (MRNY) have fought for a voice in important decisions about the park. In 2013, MRNY was instrumental in the formation of the Fairness Coalition of Queens (FC Queens), made up of a variety of community groups surrounding the park. MRNY and FC Queens called for more employees for the park’s maintenance, greater investment from the City, and greater community participation in the decisions that impact its future. We’ve also highlighted the need for an Alliance that would raise funds to make improvements, informed by the community through the Community Advisory Board (CAB). The FMCP Alliance, announced publicly by Mayor de Blasio, Councilwoman Julissa Ferreras, and many others is made up of 15 positions that include government representatives, private businesses, and community organizations including Make the Road New York. It will also include a representative of the CAB. The CAB, as spokesperson for the park’s users, will host regularly scheduled meetings in order to hear community concerns and discuss potential projects, programs and improvements. 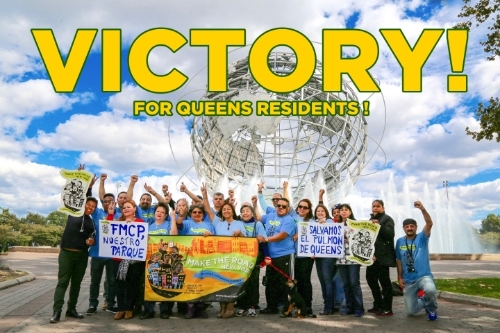 Thank you to the members of the FC Queens, Council Member Julissa Ferreras, and Mayor de Blasio for joining us in this victory which will benefit many future generations.